Hello, my dear readers! 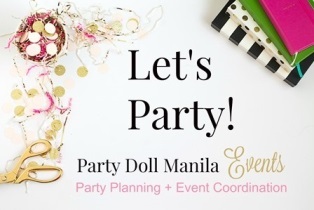 Party Doll Manila turns 2 this week. Hooray! With that, I want to celebrate this week by posting more than our usual line up. First up, I want to share with you this article I wrote for Smart Parenting magazine’s Annual Party Issue last August 2014. Since there’s only a few more days before the next SP Party Issue rolls out, I decided to kick-start the party month with this throwback article. I believe that the key to gorgeous parties lies in the details: the more thoughtful the details, the lovelier the outcome. If you want it to be unique, take your cue from your child and also yourself. I bet the first thing that comes to mind is his favorite cartoon character – but that is probably what everyone else is thinking too. You want to take it a bit further, so think of your baby’s favorite books, colors, nursery rhymes and even your own interests and journey to parenthood. These personal touches can make your party stand out. On Invites: Give your guests more reason to be excited to attend the event. 1. Add an extra oomph to a flat invitation by attaching yummy treats or cute knick-knacks to it. If budget is not an issue, then make it 3D! On Themes: While your family and friends are the heart of the event, your theme is its soul. 2. Does your baby get excited for bedtime story sessions? From The Little Prince and The Hungry Caterpillar to Peter Rabbit and Noah’s Ark, your tot will love to see his favorite characters come alive! For your preteens, there’s always Harry Potter and Hunger Games. 3. Admit it or not, it’s about us moms, too. From our favorite designer brands, memorable family adventures or even things we find adorable, we simply can’t help not to share little things about us. 4. Pay close attention to your child’s personality. Is he athletic? Does she love all things purple? How about his favorite games? My son loves to doodle, so we threw a kiddie-doodle-themed party for his first birthday. On Party Details: Research your theme; nothing beats a well-planned party. This may seem tedious, but the extra efforts will contribute more fun to your party. 5. Balloons are the very symbol of a celebration but paper pompoms, honeycombs and paper lanterns are equally charming. Kick it up a notch by trying different elements such as parasols, hats, tassels, stars and even book pages! 6. Make a huge impact with larger than life details. Who can possibly miss these life-sized decors? 7. Don’t be afraid to play with colors or break the norm. Veer away from the typical color combinations for a refreshing take. Why not try a neon-pop-art-themed party? 8. Share your baby’s fun facts and milestones of your baby with family and friends by setting up a memorabilia corner or photo gallery. 9. Light up the venue with fairy lights to create a dreamy and whimsical feel. 10. Ask a talented crafter to create handmade paper dolls, paper flowers or felt-cloth dolls. Use these lovely crafts to spruce up your table. On Cake and Dessert Tablescape: Too cute to eat? Double that WOW factor with amazing sugar art. 11. No party is ever complete without a cake and some sweet treats. Make your dessert spread party-perfect by offering themed desserts like sugar cookies, French macarons, cupcakes, Oreo pops and personalized chocolate bars. 12. Sometimes, it’s all in the presentation. Say bye-bye to those boring white serving plates and say hello to cookie towers, themed meringue towers, cupcake gallery, and toy risers. On Entertainment: As a party host, you want your guests to have a wonderful time especially since they went out of their way to celebrate this special day with your family. 13. Amp up the fun and excitement by adding these DIY booths for guests to enjoy. Set up craft stations where your little guests can unleash their creative side. 14. Let your adult guests enjoy the party, too. Aside from the usual photo-op area, prepare interactive games for them as well such as fun movie viewing, a guessing game, or a scavenger hunt to keep them entertained. 15. While magic shows and comedy acts are still in demand at children’s parties, care to try shadow puppetry, story telling, song-and-dance numbers or mad science experiment show?